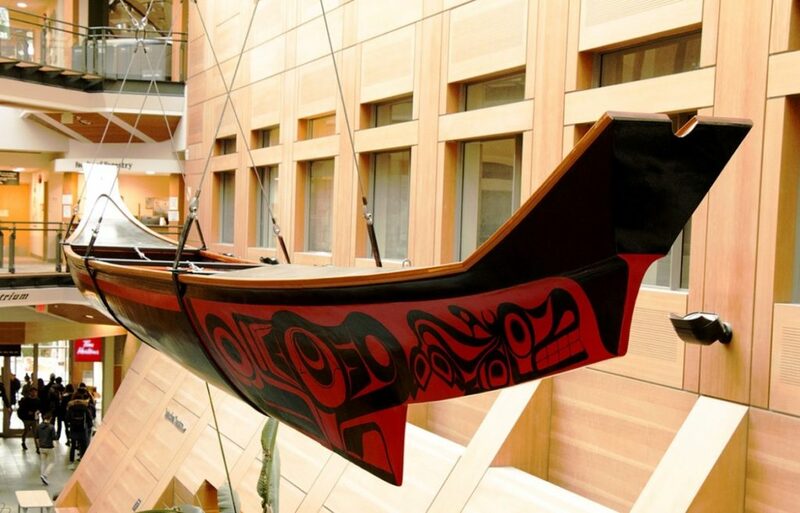 When you walk through the doors of the Forest Sciences Centre at UBC Vancouver, your eyes are immediately drawn upwards to the imposing outline of the Haida Looplex X, a traditional Haida canoe hanging above the atrium. Larger than the length of an average humpback whale, the Looplex X is one of four fiberglass replicas of the traditional Haida red cedar log canoe “Lootas” or “wave-eater”, which was carved by the late Bill Reid and his team of Haida carvers for the 1986 World’s Fair in Vancouver. The idea to suspend the Looplex X in the atrium of the Forest Sciences Centre was first proposed in 2013. 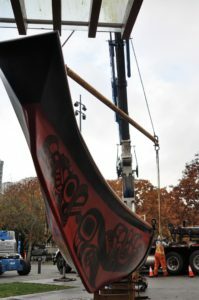 At the time, 7idansuu (Edenshaw) James Hart, Haida master carver and Hereditary Chief, and his apprentices, along with Lawrence Günther from UBC’s Centre for Advanced Wood Processing doing wood restoration, were in the midst of restoring the replica canoe. Once the canoe’s restoration was completed in 2015, Infrastructure Development, Project Services was commissioned to do the installation. The Forest Science Centre was not designed with the Loopex X in mind, so a comprehensive engineering review was required to ensure the structure could take the weight without additional support, and that the canoe could hang without twisting or bending. The project team resulted in bringing a crane on-site to suspend the canoe to find its centre of gravity and actual weight. This allowed the drawings to be completed and an installation plan began to form. Once the feasibility study was completed, there were many safety and logistical factors to consider. 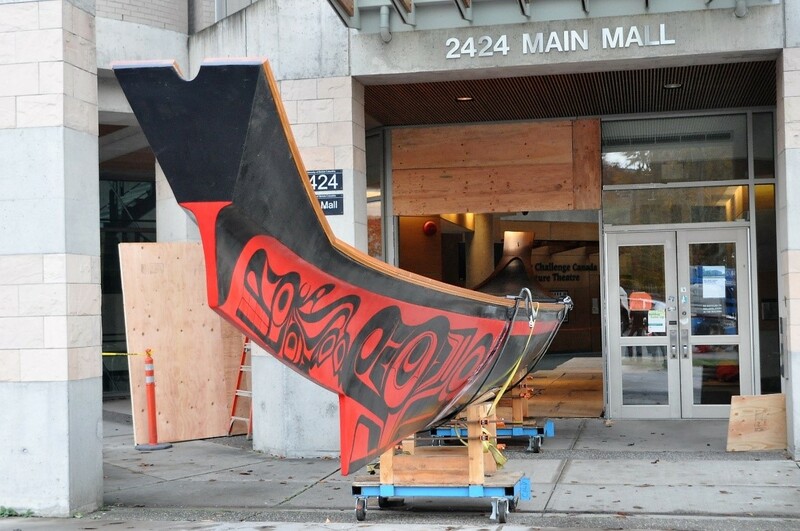 One concern stood out in particular – ensuring the fire sprinkler system would not be impacted during the installation and making sure the canoe could hold the extra weight of the water if the sprinklers were ever activated. At first, the idea was to enclose the top of the canoe with Plexiglas to keep water from filling the canoe if the sprinklers were triggered. 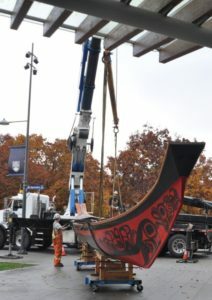 However, the project team decided this option would detract from the sculptural form and beauty of the canoe and create maintenance and cleaning issues. The team then considered drilling small drain holes inside the canoe to allow the water to pass through the canoe. The well-attended installation ceremony, which included Musqueam, was held in November 2016. The Haida Looplex X now hangs safely in the atrium space of the Forest Sciences Centre. “There were many individuals involved with the planning, coordination, and execution of this project, and we want to thank every one of them for making this project a great success,” says Darren. 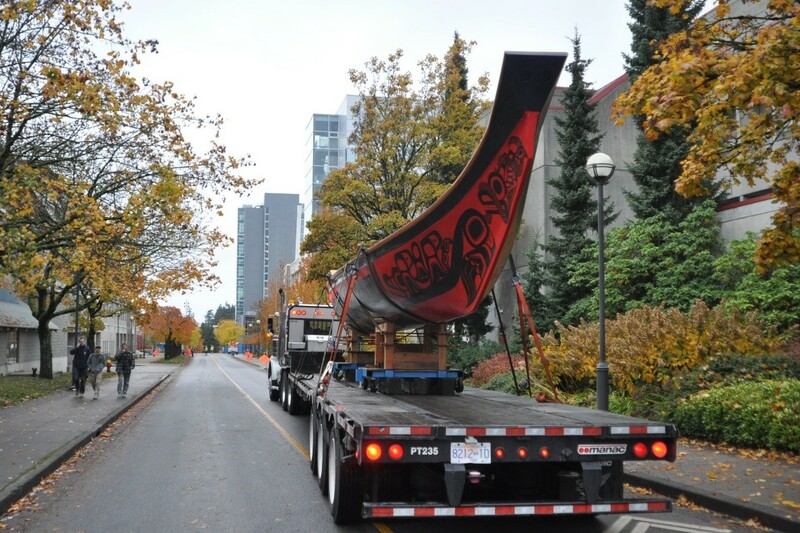 Now raised, the Looplex X signifies a strengthened relationship between the Faculty of Forestry and the Haida specifically and First Nations generally.